Emigrate-to-Australia team from Taylor Hampton Solicitors, Anna Gorna and Greg Veal were delighted to attend a ‘Global Outlook for Trade & Investment 2019’ Seminar at the Australian High Commission in London organised by FairFx in partnership with the Britain Australia Society. It was a great evening discussing politics, economics and the potential impacts of key world events which will define the investment and trade opportunities for our clients in the future. 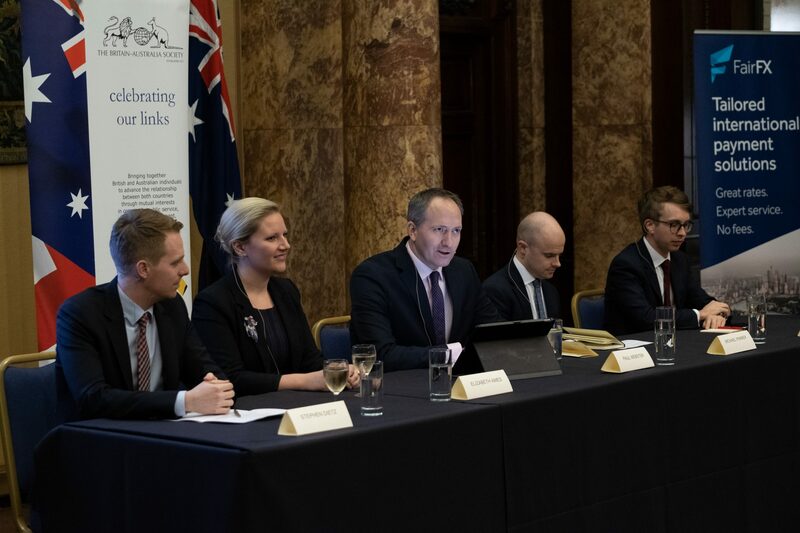 Interesting discussion and Expert Panel, including Sebastian Payne – Financial Times political leader writer, Stephen Dietz – First Secretary (Trade) at the Australian High Commission in London, Michael Rimmer – Senior Trader at currency experts FairFX, Elizabeth Ames – Executive Director, Australia-United Kingdom Chamber of Commerce. Thank you Katie and John for the invitation and we look forward to seeing you at the next event.